Terry de Gunzburg of By Terry will launch two new rose fragrances, Rose Infernale and Rouge Nocturne. Both scents were developed by perfumer Michel Almairac. Rose Infernale (above left) ~ "A smoky and spicy oriental eau de parfum with notes of Nutmeg from Indonesia, Rose Incense from Somalia, and Vetiver from Haiti." Rouge Nocturne (above right) ~ "A volumptuous ambery and powdery eau de parfum with notes of Bergamot from Italy, Rose Damascena from Turkey, and Amber Patchouli from Indonesia." 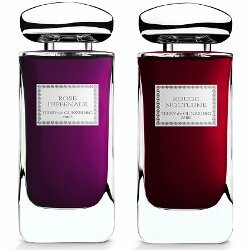 Terry de Gunzburg Rose Infernale and Rouge Nocturne will be available in 100 ml Eau De Parfum, $210 each. I wonder how soon these will be out. Rose Infernale, with its smoke, sounds right up my alley, and I love the color of the juice. Expensive, but at least you get 100 ml. Barneys has them on pre-order for delivery in August, but they don’t give an exact date. Both of these do sound quite interesting. I don’t even get upset anymore about prices. It seems like everyone is charging $120 and up lately. It’s true, it’s hardly worth raising an eyebrow. These both sound gorgeous, and the bottles too. The colors are scrumptious! I haven’t had the luck to smell any if Ms. Touche Eclat’s fragrances, but her ideas and copy really attracts me. She seems like a genuine perfume lover and not just releasing things ‘just because’. Does anybody know if you can buy any samples? The bottles look like props from the True Blood series – luxury vampire edition. Rose Infernale sounds great though. I’ve been looking for a dark rose that is not too rosy and got stuck at Rose Barbare.